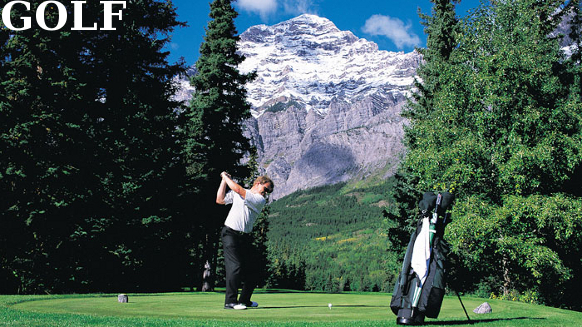 BANFF, ALBERTA, Canada – Looking for spectacular Canadian Rockies golf? Let Golf Canada’s West book your next golf vacation and enjoy the most stunning golf courses in Banff, Lake Louise, Jasper and other Canadian Rockies destinations including the Columbia Valley and Kootenay Rockies. Also visit courses in Kelowna / Okanagan, Victoria / Vancouver Island and Whistler. We provide flexible golf vacation packages that you can easily customize to your needs and travel requirements. Looking fore Stay and Play packages? Let us take care of the details so you can head to the links with just one thing on your mind: playing golf on the most beautiful courses in the Canadian Rockies! Golf Canada’s West has the best golf vacation packages in Banff, Jasper, Canmore, and Kananaskis Country. Enjoy sensational golf courses like Kananaskis Country Golf Course, Stewart Creek, Fairmont Jasper Park Lodge, Silvertip Resort, Canmore Golf & Curling Club, Fairmont Banff Springs, Greywolf and Eagle Ranch. We also offer golf packages in the Columbia Valley, Kootenay Rockies, Victoria/Vancouver Island, Whistler, Kamloops and Kelowna/Okanagan. In British Columbia, we’ll book you games at iconic golf courses like Nicklaus North, Fairmont Chateau Whistler, Okanagan Golf Club – The Quail, Predator Ridge, Olympic View and Bear Mountain. Don’t miss this Golf Canada's West Golf video before you head out to the course! Many golfers have yet to discover the outstanding golf courses in British Columbia and Alberta. For those who enjoy golf and the outdoors, there’s nothing like playing a round of golf with the majestic Canadian Rockies mountains as your backdrop. Keep in mind that these courses are frequented by elk and other wild animals due to their location. Always use caution when interacting with wildlife on the course and treat the animals with the respect they deserve.